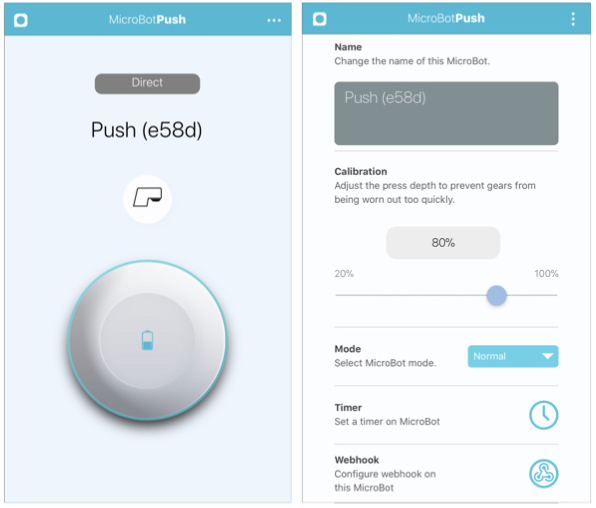 MicroBot Push is compatible with iOS and Android devices. 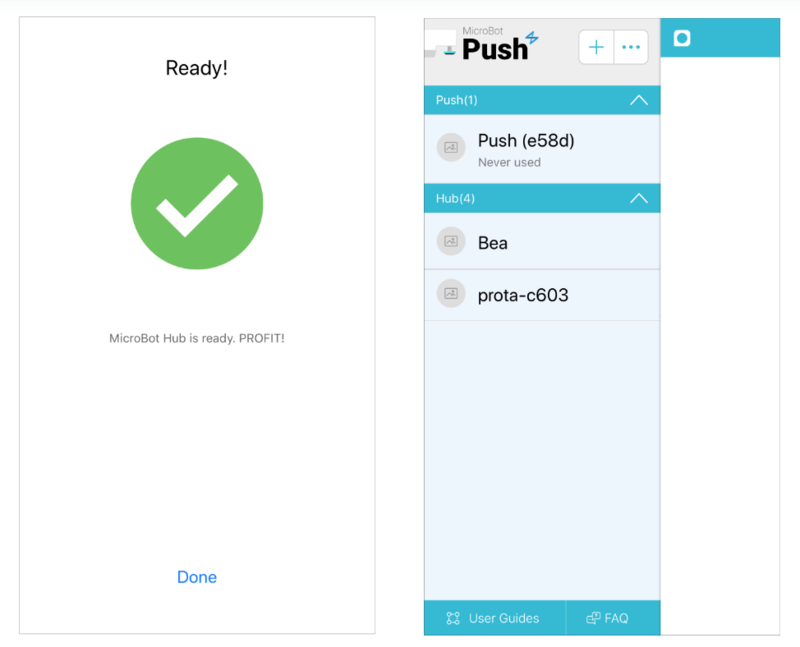 Download the MicroBot Push app for free on the Apple Store or the Google Play Store. 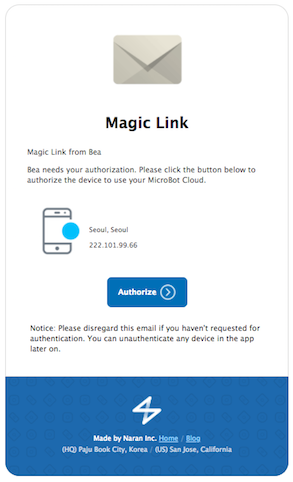 Before using MicroBot Hub, you need to authorize your device, an iOS or Android-powered smartphone or tablet, to MicroBot Cloud. 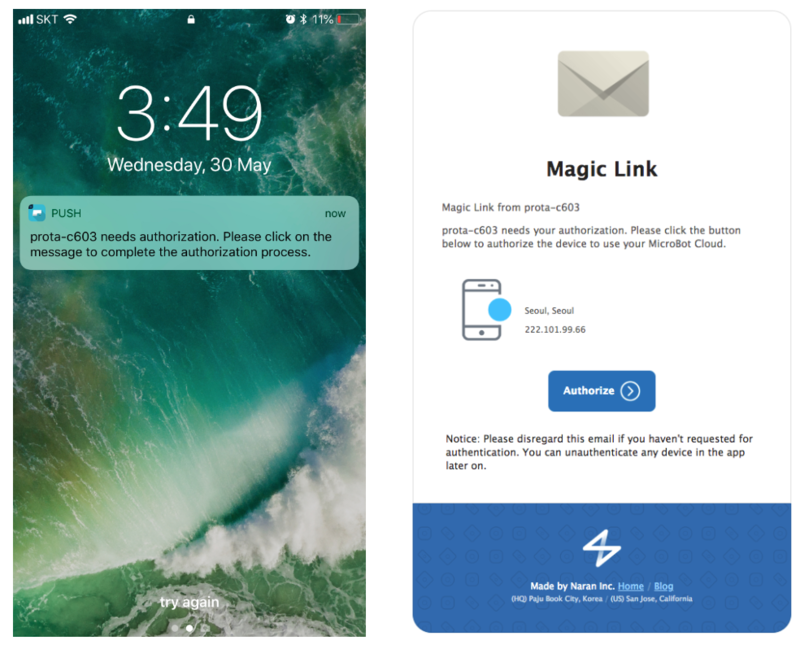 Receive the authorization link (a.k.a Magic Link). Open MicroBot Push app, enter the email address to be associated with your MicroBot Cloud. 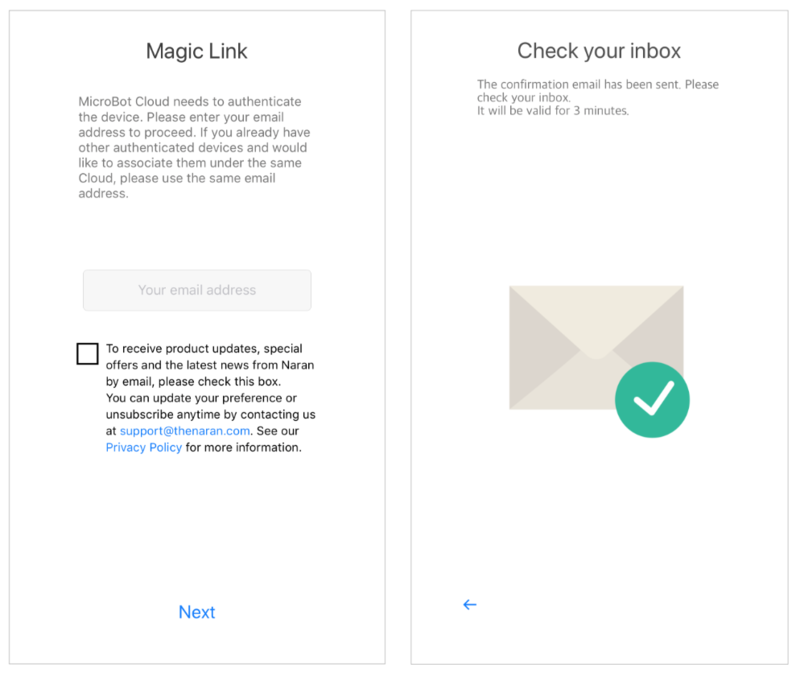 You will receive your ‘Magic Link’ by email to authorize the requesting device. Make sure your device’s Bluetooth is turned on in Settings > Bluetooth. Your smartphone or tablet must support Bluetooth Low Energy (BLE or Bluetooth 4.0 or later) to scan MicroBots. Note: Please enable the location service when the app asks for the permission. Bluetooth Low Energy is tied to the location service on some platforms. Pair your MicroBot. 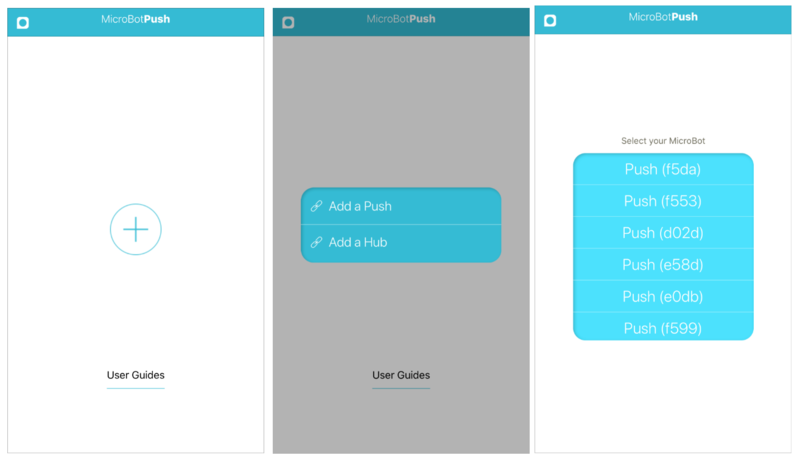 Tap on +, tap 'Add a Push', then select your MicroBot Push in the list. Once selected, your MicroBot’s LED will start blinking in different colors. 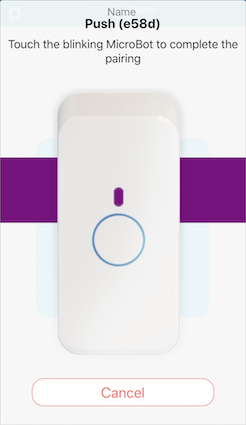 When the color of LED and the color on the app matches, tap your MicroBot. View your Push. Once the pairing is completed, you can access your MicroBot’s UI. Note: If you see an error message during the pairing process, please make sure the MicroBot’s LED is blinking in BLUE. Add another MicroBot. Slide the page from left to right to make the side menu appear, tap + and proceed like previously. Adjust the height of your MicroBot using extra plates. Remove the plate filler, and clip as many plates you need. Fix your MicroBot. Paste the double-sided adhesive tape on the plate and place your MicroBot on your appliance. Calibrate your MicroBot. View your MicroBot, tap on the 3 dots [...] at the top right corner to enter the detail mode and find ‘Calibration’. Slide left or right the calibration bar to adjust the % of press depth that will fit your situation. Done! Note: Calibrating your MicroBot is important in order to ensure a stable and sustainable use. 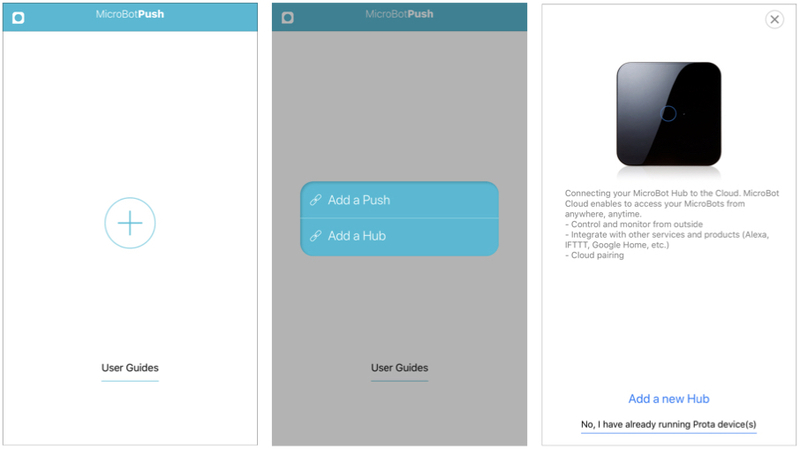 MicroBot Hub (aka Prota hub) is a bridge between the MicroBots and the Cloud. 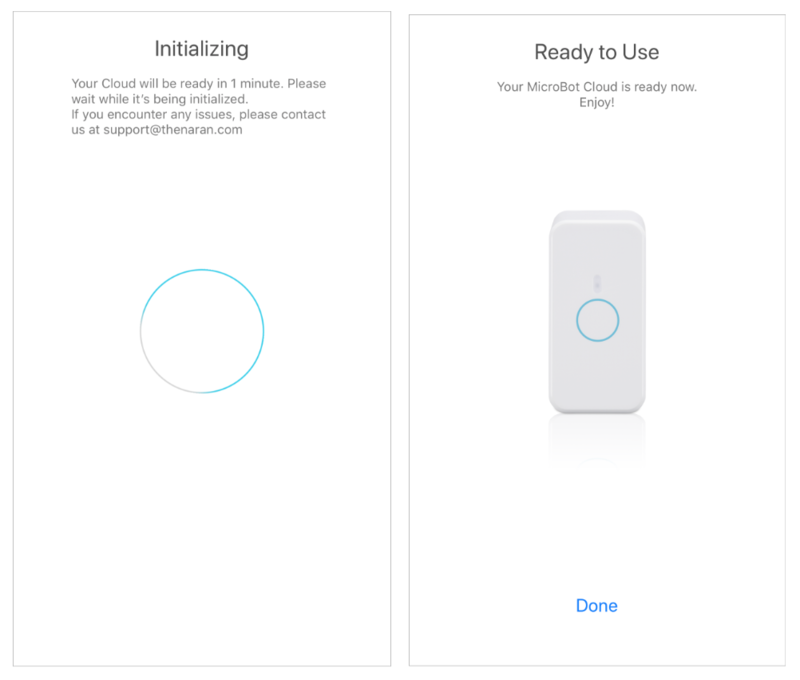 It is optional but useful to add a Hub to ensure that MicroBot Push is stably connected to MicroBot Cloud, making it always available for remote control and integrations, wherever you are. Installation. 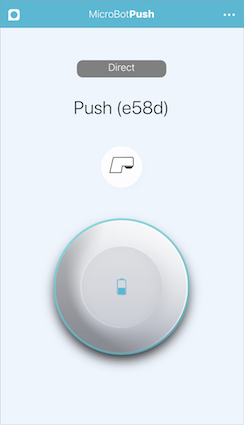 Power your MicroBot Hub and wait until the AP mode is activated. In AP mode, MicroBot Hub’s LED blinks alternately in blue and red. Note: If the LED never becomes blinking blue and red, please make ensure whether you’re using a 5V-2A adapter. Some power outlets have an unstable power source, so please also try a different outlet, especially when the LED stays in BLUE indefinitely. Add a Hub. 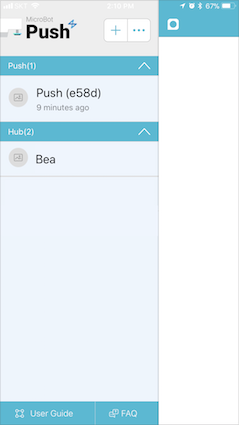 In MicroBot Push app, tap +, and select ‘Add a Hub’. Then, tap 'Add a new Hub'. Connect to the Hub. 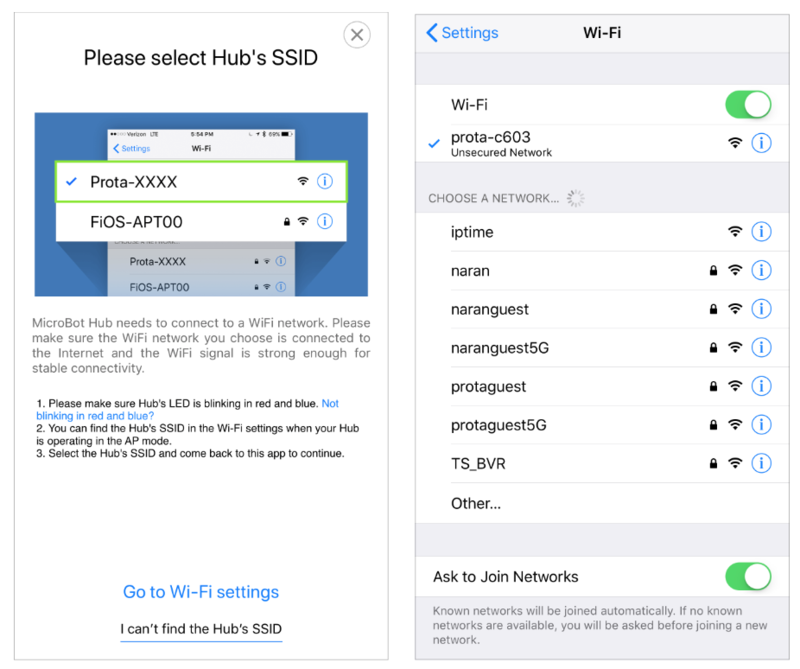 Go to your device’s WiFi list in Settings, connect to your MicroBot Hub's SSID (prota-xxxx) and go back to MicroBot Push app. Connect the Hub to the WiFi. Choose your WiFi’s SSID, enter the password, and tap ‘Next’. 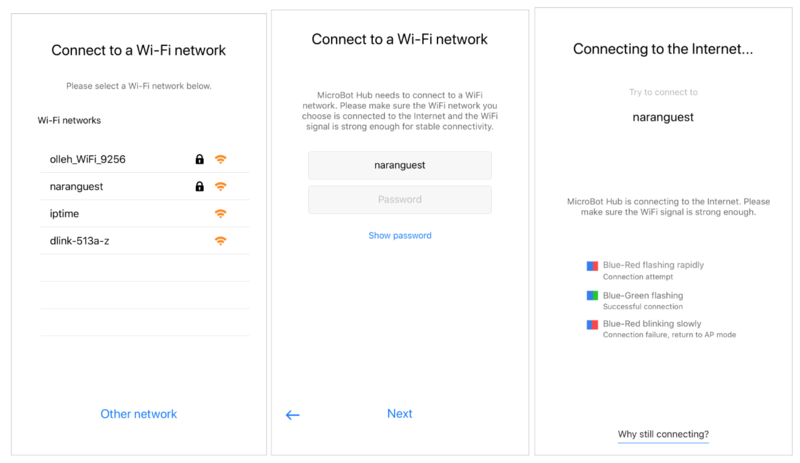 The Hub will automatically connect to your WiFi network. It can take up to 5 minutes to connect. Once the connection is successful, the Hub’s LED will blink in green and blue. Note: Please make sure the WiFi network you selected is connected to the Internet. If you’re setting up from Prota S, please ensure that the WiFi network contains only alphanumeric characters in the password. Note: If the LED doesn’t become blinking blue and green in 10 minutes, please reboot the Hub and try again. Do not reset the device. Initialization. 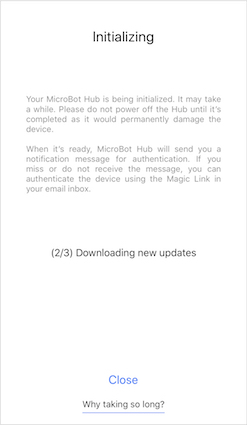 Once MicroBot Hub is connected to the network, wait until the initialization is completed. It may take a while. To get more detailed information on how to get started with your MicroBot Push step by step as well as comprehensive support information, including guides and FAQs, is available in our Knowledge Base at support.thenaran.com.